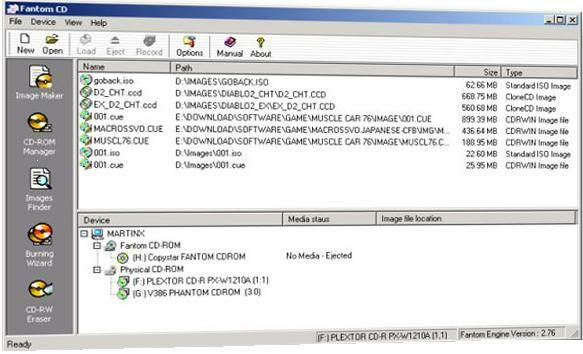 by An Chen Computer Co., Ltd.
Fantom CD is a program for reading CDs and running CD programs without a CD by creating a virtual CD-ROM drive on the hard disk using software methods. This emulator allows you to run CD-ROM applications from your hard drive or network server. In your hard drive space, you can establish and access up to 31 different virtual CD-ROM drives. From the moment you use it, there is no more need to search CD-ROMs or load CD-ROMs in the drive. There is no need to wait for the CD-ROM drive to run, either. You also do not need to change the CD-ROM to run another application. You can also use it to record the image files to empty CD-R disc. If you want to enjoy here then come here and enjoy this site http://windowstuts.net/synchronize-settings/and now if you want to try then come here. This one can make ALL the virtual drives as you want, Daemon can just make 4 drives. 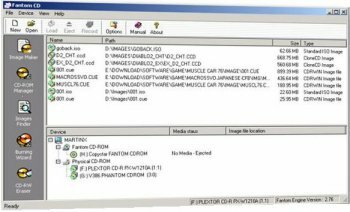 So thats pretty much the reason i use FantomCD, after all...all virtual CD/DVD appz is pretty much the same, so go for the extra features..
Why listed now ? Ok. First of all program is A+. But 1860 was posted to the website back in June 11. Beta news to get attention ! This was the first virtual cd program I used until I found Daemon Tools which is easier to use in my opinion (no need to mount and then load the image in two separate steps). Certainly useable, but I still prefer DaemonTools. I liked this program a lot. Unlike similar products used (FastCD a long time a go, VirtualCD) this program actually has a good user interface. Secondly it reads just about any CD-image format thrown at it. i.e ISO, CloneCD, BlindWrite, etc. Being a fan of BlindSuite, I found this very appealing. i have BlindWrite images of about every program or game-CD I own stored on my harddrive. It is great to just be able to mount one of these images and access the files on it. I have not yet tested it's own burn/read capabilities enough, but a small test with its nuilt in image-creator told me to stick to BlindSuite. This wil probably be improved. OK software, but Daemon Tools blows this away .... and for free. Thank you for your comment, it actually worked perfectly. Up until now, exellent product!!! Possibly..the best Virtual CD program. 1: It works with W98,WinMe, W2000 and XP. 2: It can handle Video CD. DVD. CD seamlessly. No other Virutal CD program can do this. Direct CD ever ( works with XP). Bottom Line: If you want to enjoy here then come here and enjoy this site http://windowstuts.net/synchronize-settings/and now if you want to try then come here.